What are the key challenges facing PNG? With a rich and varied culture, PNG is the largest Pacific Island nation and is home to a diverse population of 7.6 million people with around 850 languages. With more than 76 per cent of the population under the age of 35, it is estimated that the national population will reach 9 million by 2020. Despite experiencing significant economic growth over the past decade, the benefits of this growth have not been shared equitably. For most Papua New Guineans, accessing a fair and safe livelihood, high quality education, effective health care and other basic services remains a daily challenge. Education remains one of the biggest challenges facing Papua New Guinea. 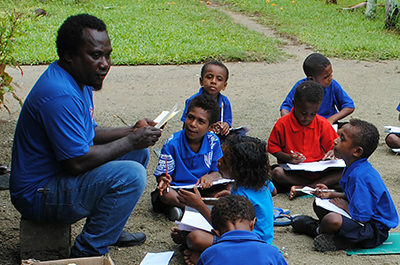 The average level of formal education for adults in PNG is less than 4 years while the national net enrolment rate of 63% is the lowest in the Asia-Pacific. Today, approximately half of all school aged children are not attending school, with only one in three children completing their basic education. It is clear that there remain a number ‘in school’ barriers (limited infrastructure, poorly trained teachers and school administrators, absenteeism and financial constraints) and ‘out-of-school’ barriers (limited parental support, low value placed on education due to poor employment opportunities, and law and order problems) that limit ongoing access to education. Children with disability face additional challenges in accessing education. It is estimated that there are 975,500 people with disability in PNG, of which only 2 per cent have access to adequate services. While the government has taken policy measures to endorse national inclusive education, these policies are often not effectively implemented in rural schools. Stigma and cultural beliefs around disability lead to widespread exclusion of people with disability in PNG. Furthermore, physical access to education and health services for people with disability, particularly those in remote communities, remains a huge challenge. Gender also represents a significant barrier to education, with primary school completion rates as low as 45 per cent for girls compared to 59 per cent for boys. Finally, children in rural areas are significantly less likely to complete their education than children in urban areas and with 87 per cent of the population living in rural and often very remote areas, this presents a significant development challenge for both government and non-government actors. What is Mary MacKillop Today doing to respond to this need in PNG?